Here is the build thread! As time passes this post will slowly get edited with the most up to date info. VR4	10KB TRIM* *VR4 was designated as a panel pot. ***OLD VR4--- 10KA "CV Adjust"
There are pads for an both a SMT and a thru-hole tempco resistor on the pcb the board, install only 1 resistor. 1) the four 2N3904 transistors, need to be installed "backwards" to what the silkscreen suggests. 2) Gate polarity fix, a 2n3904 (or similar) transistor needs to be tacked on to the gate output to convert the original "s-trigger" out to V-trigger out..
3) Pin 12 of the LM339, needs to be connected to the -15v (or -12v) power supply rail. The fix: On the lm339, pin 11 is connected to -15 (or-12v) so you'll have to bend and solder pin 12 to pin 11. The hole on the PCB for pin 12 is connected to the ground plane, so just jumpering the pads on the pcb, will not work. Heres a picture showing it jumpered. 4) Tracking fix. This Fix requires 2 trace cuts and two jumpers. Next, make a single trace cut on bottom of PCB between where VR2 and R23,24,27. as seen below, between the top jumper solder points. 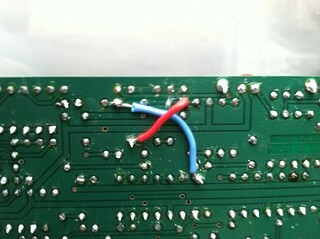 Finally, solder two wire jumpers as shown in picture above. 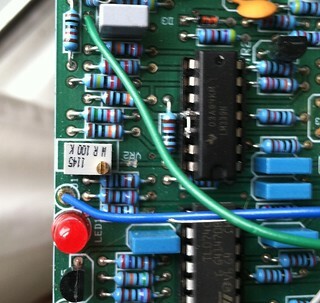 With no input, Set All knobs to "0"
Connect an Oscillator (VCO1) to the input jack. For calibration, a lower harmonic wave shape like sine is best, but other wave shapes will work. Adjust gain knob so that the "LED1" just lights up. b. 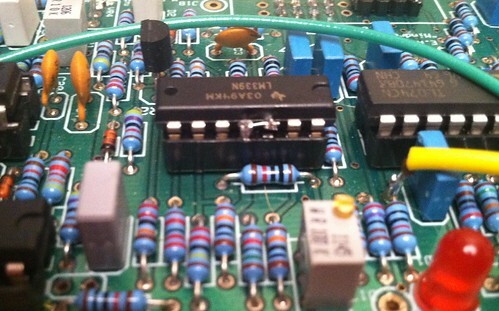 Adjust VCO2 to match the pitch of VCO1. 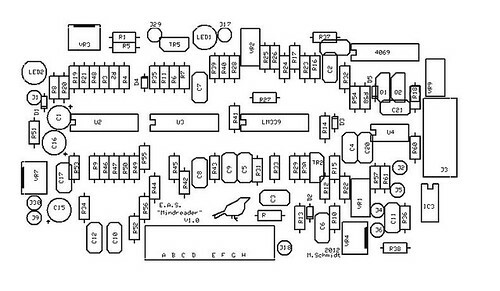 Check that the VCO2 tracks VCO1 when switched from 55hz,110hz, 220hz,440hz...etc. if tracking is off, repeat steps a thru d until ESP has satisfactory tracking. More coming, but this should get you up and running! YAY! Will get on this sooooon. I've got a 15V system, have any of the values been tweaked for 12V that I would need to tweak back? On the Log Amp, I'm not clear on what the frequency adjustment (J5) does. Is it just an offset? If I don't install the CV Adjust pot, how does the signal get to J6? It looks like J6 comes off the center tap of the pot as does J18? I have a V/Oct system, but I would like to preserve the option to use the V/Hz output as well. Can I do both the jumper from J6 to J4 *and* the CV Adjust and V/Hz outputs? I'm tempted to wire up the Log Amp independently with it normalled to the V/Hz output.... Then I can do other things with it even when I'm not using the ESP proper.... Does that seem feasible? yes it works as an offset, it sets the base frequency. J18 and J6 are in fact connected to the same point on the pcb. The reason J6 exists, is to provide a pad to jumper to J4. 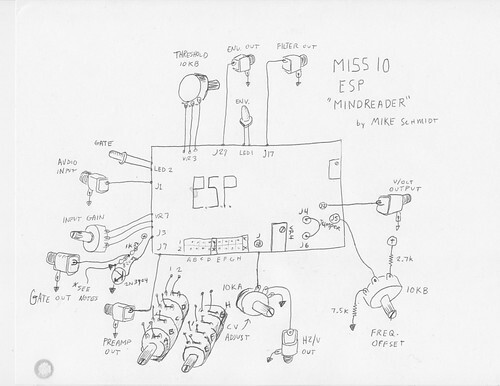 Theres a note regarding this on the bottom, right hand side of the wiring diagram. What I didn't note is that you should install a 10k trim pot in place of the panel mount cv adj. pot. I originally just jumpered across the top and middle pot pads, but found i needed some attenuation to the log amp. This is a great idea. I tried to keep them separate so this would be possible, hence the jumpers. I have yet to writeup the trimming procedure... coming soon. Excellent, thank you for the quick reply. I was definitely thinking that if I were to use both I'd want to (probably?) set the V/Hz pot to max. If you say it needs a bit of attenuation, I may try to kludge a trimmer between J6 & J4 then. I can't see 13 or 14 on the silkscreen either. While we're looking at the silkscreen, what's the unlabeled R near the 4 way pot connections? Edit 2: DUR, I see R in the BOM. I have no 12000pF caps (of any sort), no 43.2K resistors, and no 20 pin headers. As you can see I already kludged the 4.3K resistor. So here is where I stop for a while.... I spose I can work on the panel components and mounting bracket. Here's a revision to the 5u panel I posted in the other thread, taking into account the Log Amp. Using free tools to convert bitmap into vector, so possibly not the best quality. 3) the nut for the V/Hz input is going to cover the arrow. Edit: 4) the LED at the top is too close, less than 3/8" clearance to the top rail. So is the high cut A-D and the low cut E-H ? I assumed I had the two pots correctly identified (A-D/E-H) and have finished the build. 1) What is the calibration for the ESP circuit itself (two trim pots)? 2) What is the recommended calibration for the Log Amp? 3) One of my two 4-gang pots makes a crackling noise when I turn it, and I'm afraid I may have screwed it up somehow--do you have any extras I could repair it with if so? (For cost and shipping, of course). The knobs aren't nearly as bad as I feared they would be, centering wise. 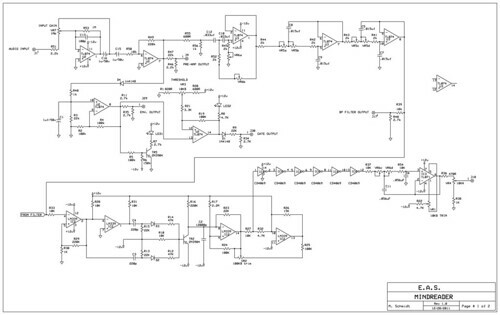 I think the diagram for the frequency offset is backwards. The frequency went up when I turned the knob down, so I've reversed the connections (7.5k to ground and 2.7k to V+ still, just opposite terminals on the pot). Weird though because then higher voltages lead to lower frequencies, not sure what's up with that. I also wired my LEDs backwards ... having them right gives me a better idea how to set input and threshold. I'm getting a lot of distortion, it seems, particularly the tail of the envelope seems very crunchy. I have a patch I don't want to tear down just yet, so I haven't eliminated the patch itself as a factor. I'm in the process of ordering the parts for this from digikey. A little confused though when it comes to the VR section. Does the "B" in VR1 10KB TRIM mean that its a logarithmic trimmer? Or would any 10K trimmer work? what good is the v/hz input? When would one need this? Also, if all my vcos accept 1v/oct, is there any reason to include the v/hz output? It's really only good for playing around w/other v/Hz stuff. I plan on just ignoring it. 1) I don't have any V/Hz equipment, but that doesn't mean a linear rather than expo output couldn't be interesting to use somewhere. JulianW asked in the PCB thread if I could upload the photoshop files from my panel design. I'm not entirely certain which version he was interested in, so here are both, as .PSD. They're 300dpi, but not vector, because I don't have a good vector solution, and I haven't remade them in FPE. They do resolve the issues I pointed out earlier--LED too high and arrow too close to the jack. Note also that these are black on white which is how I do my design; inverting them should be trivial for any tool able to read .PSD format.